Sources: Young, Vernon. “I’ve Been Reading These Film Critics.” Hudson Review 21 (Summer, 1968): 337-344; Henry, Garritt. “Whole Picture.” Art International 15 (December 1971): 89; Battcock, Gregory. New Ideas in Art Education; A Critical Anthology. New York: E.P. Dutton, 1973; Nabakowski, Gislind. “Raimund Girke.” Heute Kunst (G.F.R.). No. 4-5 (December 1973): 16-19; “New York City Edition.” File (Canada) 3 (Spring, 1976): 18-61; Crimp, Douglas. “Yvonne Rainer, Muciz Lover.” Grey Room no. 22 (Winter, 2006): 48-67; [obituaries:] “Art Professor Is Slain in San Juan.” New York Times December 26, 1980, p. B2; [remembrance, including Rosenblum recollection] Russell, John. “Art People.” New York Times January 16, 1981, p. C20. Bibliography [dissertation:] Constructivism and Minimal Art: Some Critical, Theoretical and Aesthetic Correlations. New York University, 1979; edited. 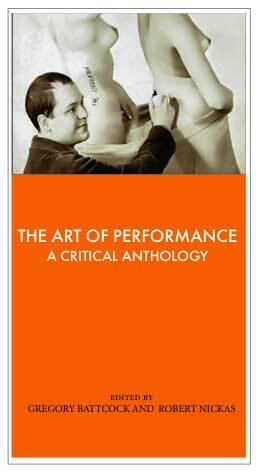 The New Art: A Critical Anthology. New York: Dutton, 1965; edited. The New American Cinema: A Critical Anthology. New York: Dutton, 1967; ed. Minimal Art: A Critical Anthology. New York: Dutton, 1968; Idea Art: A Critical Anthology. New York: Dutton, 1973; New Ideas in Art Education: A Critical Anthology. New York: Dutton, 1973; “Aesthetic for Rebellion.” Art and Artists 7, no. 10 (January 1973): 12-14; “Aesthetics and/or Transportation.” Arts Magazine 48, no. 1 (September-October 1973): 33-5; “Abstract Expressionism: The End of an Age.” Domus 528 (November 1973): 367; “Exhibition in Rome: Contemporanea [Mostra a Roma: Contemporanea].” Domus 531 (February 1974): 48-52; “It Is.” Arts Magazine 48, no. 7 (April 1974): 31-3; “Andy Warhol: New Predictions for Art.” Arts Magazine 48, no. 8 (May 1974): 347; “Marchese Emilio Pucci di Barsento.” Arts Magazine 48, no. 9 (June 1974): 40-2; “Warhol: and an Exhibition in October in Milan [Warhol: e una Mostra in Ottobre a Milano].” Domus 541 (December 1974): 36-7; edited. Super Realism: A Critical Anthology. New York: Dutton, 1975; “New York Developments.” Art and Artists 9, no. 11 (February 1975): 4; “Art in America: Saari, Hirshmann, Oppenheim.” Domus 546 (May 1975): 53-4; “An Interview with Salvador Dali.” Art and Artists 10, no. 5 (August 1975): 4-5; “Dali.” Domus 550 (September 1975): 50-1; “News from New York.” Domus 550 (September 1975): 53; “Controversy in New York, Concerning the Article by Tom Wolfe, 'The Painted Word'.” Domus 551 (October 1975): 50-1; “Andy Warhol: A Book.” Domus 553 (December 1975): 52; “Good Taste, Bad Taste.” Domus 555 (February 1976): 47; “Video and Napkins.” Domus 559 (June 1976): 52; “Les Levine: 'Media Artist'.” Domus 560 (July 1976): 50-2, I-IV; Battcock, Gregory. “The Venice Biennale [La Biennale di Venezia].” Domus 564 (November 1976): 1-19, I-VI; Why Art: Casual Notes on the Aesthetics of the Immediate Past. New York: Dutton, 1977; “New York: Art Exhibitions.” Domus 566 (January 1977): 53-5, III, VI; “Without Importance.” Domus 567 (February 1977): 52-3, VI; “Soho: The Artists' Day.” Domus 575 (October 1977): 55; edited. New Artists Video: A Critical Anthology. New York: Dutton, 1978; "Forward." in Meisel, Louis K. Photo-realism. New York: H.N. Abrams, 1980; “Ocean Liners: The Way They Were.” Art in America 68, no. 6 (Summer 1980): 142–7; edited. Breaking the Sound Barrier: A Critical Anthology of the New Music. New York: Dutton, 1981.